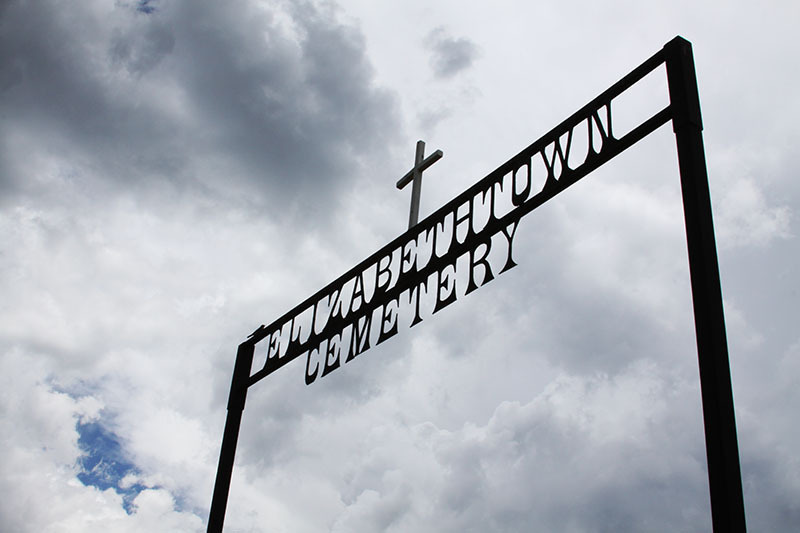 My October shoot had to be centered around a ghost town in respect to the Halloween holiday. The real mystery about Halloween is when was the first actual Halloween event celebrated. There are many theories and speculation but whenever it was it surely has started a tradition many millions love to celebrate in many parts of the world. The ghost town I choose to shoot in and around is called Elizabethtown and is located in northern New Mexico near the Colorado border. Certainly in a very scenic and beautiful area, the mountainous region is nestled between the towns of Red River and Angel Fire, New Mexico. The drive is breathtaking and is along the New Mexico Enchanted Circle Scenic Byway. Elizabethtown, New Mexico was the first incorporated town in the state of New Mexico and managed to acquire a population of 7,000 from 1868 to around 1930 thanks to the gold found in the area. There is a museum with interesting facts about the town and some great old remains of buildings and structures that once supported a thriving community. One resident of Elizabethtown was known to be a serial killer and was found out by his own wife. One evening his wife frantically entered a popular saloon in town covered in blood and screamed out that her husband had been killing travelers that were staying in their boarding house. It was even rumored he killed two of his own children. The angry citizens of Elizabethtown took matters into their own hands and tied a noose around the neck of the accused serial killer and rode around town until his demise. The term Wild West was certainly living up to it's name in Elizabethtown. My model, Samantha and I took a stroll through the Elizabethtown Cemetery only to find very old and very interesting tombstones and grave sites. 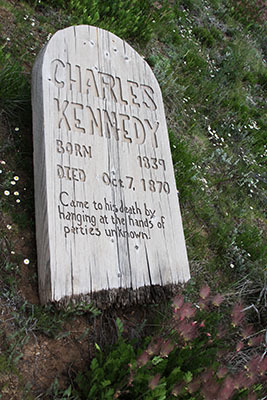 We even found the old wooden carved tombstone of the accused serial killer, Charles Kennedy . It looked like it had been deliberately knocked over with large spiky splinters of wood protruding out of the break. Even though the cemetery was very interesting and in a rather beautiful setting we decided to find a more peaceful and inviting location to shoot our Little Red Riding Hood themed attire in. Finding the perfect location for Samantha was not a struggle considering the mountains of New Mexico are full of beautiful greenery and rich dark forests. We found a spot near the side of the road with a running creek and lots of great shadows to work with. We used a tripod for the lighting gear and managed to produce some nice rich images to show off her vivid red hooded cape. Samantha works so well with a themed shoot. She has been in several films and her acting abilities really paid off for this style of shooting. I am so happy with our results and our adventure in finding the perfect location was a fun undertaking full of interesting and historical treasures. The setting we choose was clearly the perfect choice. Unknowingly, we picked a location with a natural spring of water that flowed beautifully into the creek we were at. As we worked on our photos we had many visitors stop by and capture the water in drinking bottles and canisters. I guess the water coming out of the mountain from an old pipe was suitable and clean for drinking. We saw all walks of life come fill up their water containers and we were fascinated by the amount of people that frequented this magic spot overflowing with pristine water. Of course I had to try it out since so many were drinking from the source and I have to say the water was delicious. Cool and clean and probably some of the best tasting water I have ever tried. One of my favorite shots from this series with the beautiful Samantha looking off wondrously into the magical skies of the forest. A perfect setting for the perfect Little Red Riding Hood ensemble. So many beautiful images were created and it was all thanks to the patience of the team that help put all of this together. Samantha the model and Janice, my dear photographer friend whose creativity and technical skills help elevate my own. 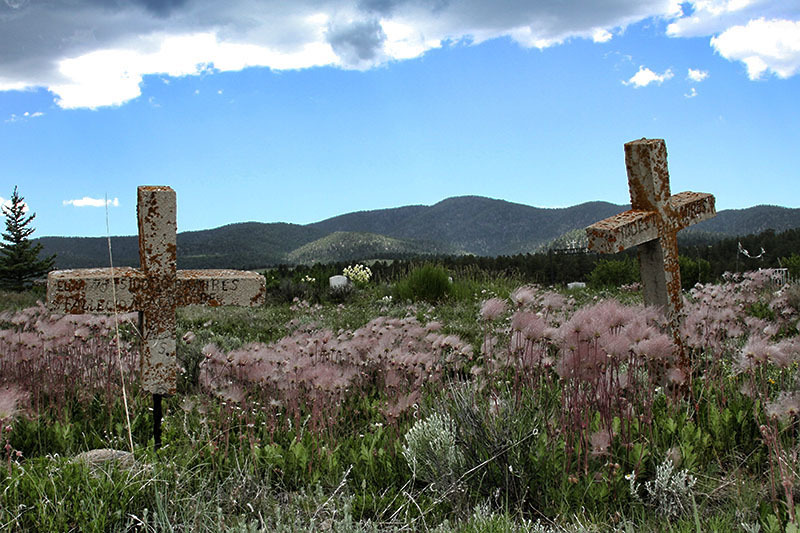 The Enchanted Circle Byway in New Mexico outside of Taos is certainly full of surprises and unique beauty only found in this part of the country. 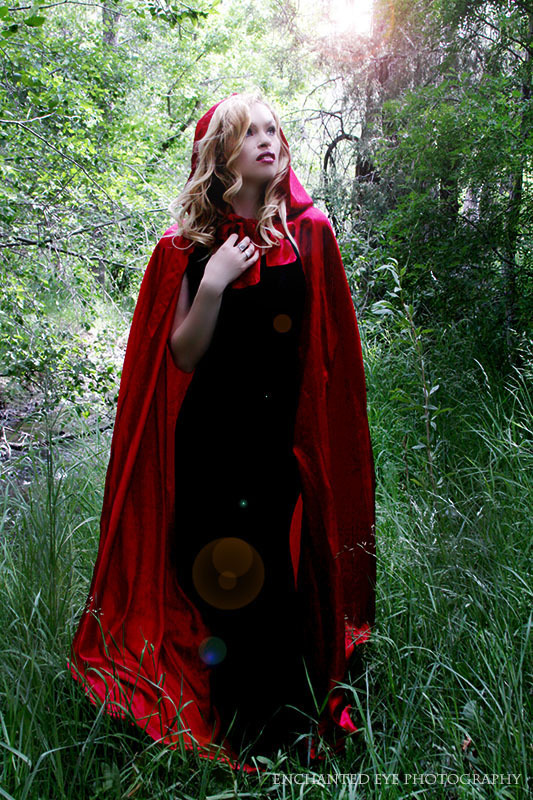 For myself it was the perfect place for a photo shoot with a Little Red Riding Hood theme. Dark forests with deep shadows and tall overgrown grasses were just a little bit of what made this location ideal. Thank you again to Samantha and Janice for making this happen. Looking forward to the next photo adventures with you both. Also thank you to the nice people in the state of New Mexico.